This exhibition began with a question: is it possible for a particular aesthetic form or structure to express both abstract concepts and political ideals? A brief, yet formative moment in history suggests that it might be. Just after World War I, a group of Western European artists and architects who were committed to non-authoritarian and socialist principles envisioned a new, modernist world, constructed out of crystalline forms and structures. In contrast, their fellow colleagues and rivals believed that the geometry of the square, rectangle and grid represented the most essential and efficient solution to economic and aesthetic questions. The rationalists won the argument, but what happened to this alternative model? Here, examples of these early explorations — mostly forgotten until recently — are paired with subsequent investigations and studies from the 1960's and today. Together, these works propose that the fractures, reflections and the natural, imperfect geometry contained in the crystalline represent a way of thinking and building that encourages myriad solutions. Three eras from the past 90 years are juxtaposed and intermingled within the exhibition: 1918-1922, 1964-1966 and today. 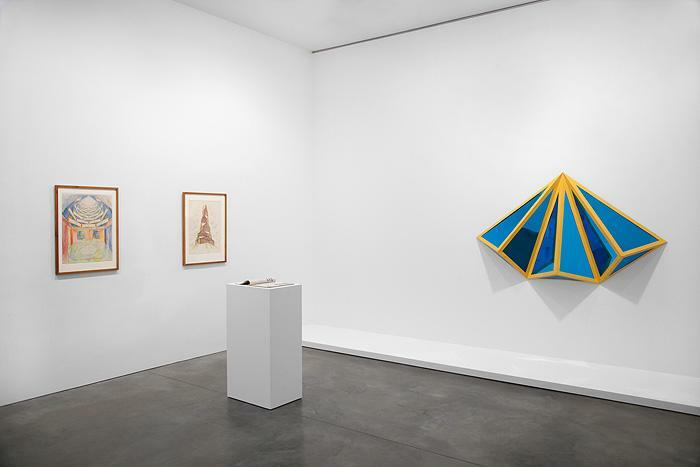 Woodcuts, watercolors, a book, a postcard and a photograph by German and Czech artists and architects are accompanied by a large sculpture by Robert Smithson and a period fashion magazine which contains his influential essay "The Crystal Land". Interspersed among these historical works are recent projects by four contemporary artists (including myself) that further explore the implications of crystalline structures. These depictions are not simply gestures towards symbolic, romantic or science fiction motifs, but are images and objects that describe an abstraction that is both made and found, planned and unanticipated. Though this direction was at times suppressed or overwhelmed, throughout the twentieth century and particularly today, there have been artists who have pursued an aesthetic based on the complexity and diversity of the crystalline. 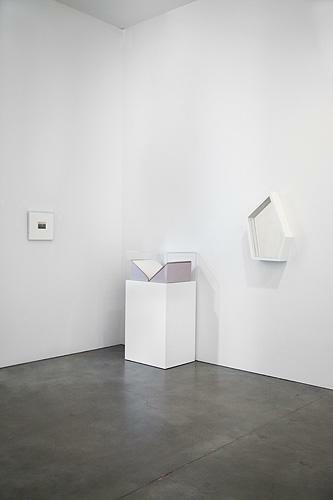 These works of sculpture, photography, drawing and writing are brought together in order to sketch an outline for an ongoing history about the search for ways to represent a multitude of possible viewpoints and not a single universal one. 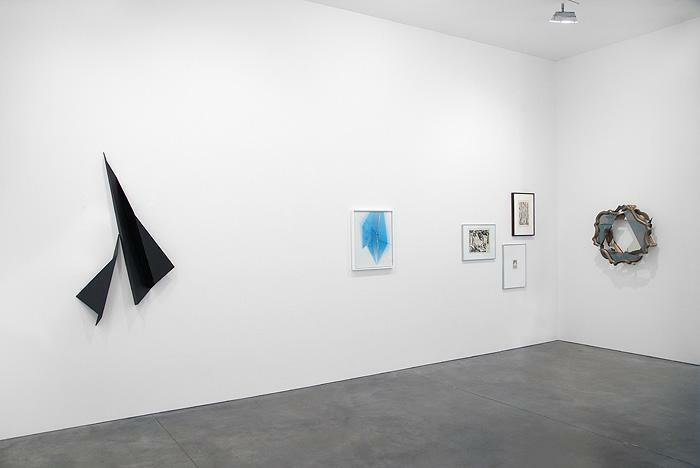 Andrea Rosen Gallery is delighted to announce the third in a series of exhibitions curated by the gallery's artists that expand on their individual influences, interests and inspirations. An original copy of a limited-edition book by the architect Bruno Taut, Alpine Architektur in 5 Teilen und 30 Zeichnungen des Architekten Bruno Taut (1919), depicts a modernist architectural environment situated in the mountains. This artist book formed the center of a portfolio of projects created by the Gläserne Kette (the Crystal Chain group), whose members included Walter Gropius and Wenzel Hablik. The Crystal Chain's ideas were highly influential on the early Bauhaus — until director Walter Gropius renounced the previous political ideals of the school in 1923 (following the collapse of the German Socialist revolution) and declared that the school would then focus instead on ideas about technology. Of two woodcuts by artist and Bauhaus faculty member Lyonel Feininger, one from 1919, Kathedral, is extremely well-known due to the fact that it was published in the first prospectus for the Bauhaus in Weimar; the second is from the previous year, Zirchow VII., Nr. 1 (Prasse W 11). Fellow Bauhaus faculty member Walther Klemm's Postkarte zur 50. Tonkünstlerversammlung des Allgemeinen Dueutschen Musikvereins Weimar depicts a crystalline monolith as a shining beacon or lighthouse. Wenzel Hablik, a painter and an architect from the Czech Republic, is represented by two watercolors that were part of the Crystal Chain exchange: one of an interior Freitragende Kuppel, 1919, and one of an exterior, Cyklus Austellungs-Baute "Würfel", Variante 4, 1921. An important touchstone in the exhibition is the tiny photograph of Walter Gropius' 1922 Marzgefallenen-Denkmal in the Weimar cemetery. This concrete sculpture was a monument to those workers who died defending the fledgling socialist government. This black and white photo was taken soon after it was built (by an unknown photographer); the Nazis destroyed the monument in the 1930's, though it has since been reconstructed. It is with great pleasure that we also announce the release of Josiah McElheny's stunning new major monograph, A Prism, published by Rizzoli, which serves as the definitive publication thus far on his unique practice. We are also delighted to announce the release of McElheny's extraordinary artist's book on the German writer Paul Scheerbart, The Light Club, published by The University of Chicago Press. These publications follow a number of noteworthy essays, including "Readymade Resistance", Artforum, 2007 and "Invisible Hand" Artforum, 2004. We are especially excited to announce McElheny's upcoming project at the CCS Bard Hessel Museum of Art in the summer of 2011 scheduled to coincide with the Blinky Palermo retrospective at CCS Bard and Dia:Beacon. In dialogue with the Palermo exhibition on the other side of the museum, it will involve McElheny curating and intervening in the display of the permanent collection. Josiah McElheny lives and works in New York. He has exhibited widely, including recent solo museum projects at the The Museo Nacional Centro de Arte Reina Sofía, Madrid (2009), Henry Art Gallery, Seattle (2008), Moderna Museet, Stockholm (2007), and MoMA, New York (2007).